Yes, yes, I know it’s not big and it’s not clever…. If you ever find yourself sat at computer on a Friday afternoon, feeling a little downcast and waiting for the weekend to kick in, then cheer yourself up with Cursebird! 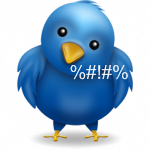 Cursebird is a ‘real-time feed of people swearing on Twitter’. It not only displays a live feed of tweets sent by irate tweeters but also rates the frequency of swear words used. There are some absolute comedy gems on there that are guaranteed to raise a snigger in even the most po-faced party-pooper.